Posted in Outreach News on March 6, 2014 by Susan Cobb. 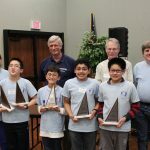 The Whittier Middle School Mathcounts team, coached by Katherine Brooks (assisted by Harold Brooks) won the state championship last weekend! 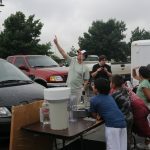 Posted in Outreach News, People News on August 3, 2012 by Susan Cobb. 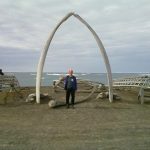 A team of scientists including NSSL’s Bob Rabin introduced North Slope Alaska Native students from Barrow, Alaska, and other small villages to weather and climate science through two STEM courses recently. Posted in Outreach News on June 15, 2012 by Susan Cobb. 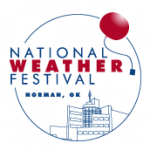 NSSL’s mobile mesonet was on display for the third year at the Apache Tribe Environmental Camp, held annually near Apache or Fort Cobb Okla., about one hour southwest of Oklahoma City. Posted in Outreach News on November 16, 2011 by Susan Cobb. NSSL scientist Bob Rabin recently returned from the 33rd annual American Indian Science and Engineering Society Conference held in Minneapolis, Minn. November 10-12, 2011. Posted in Outreach News on October 13, 2011 by Susan Cobb. 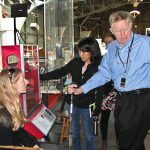 A team from NSSL spent a week at the world-renowned San Francisco Exploratorium to work with staff as part of the NOAA Scientist in Residence program. Posted in Outreach News on August 19, 2011 by Susan Cobb. Posted in Outreach News on November 18, 2010 by Susan Cobb. 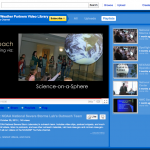 A new video on NSSL’s outreach efforts has been posted on the NOAA Weather Partners You Tube channel: http://www.youtube.com/user/NOAAWP. Posted in Outreach News, Photo of the Month on October 7, 2010 by Susan Cobb. 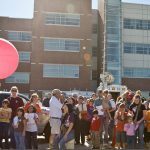 Posted in Outreach News on October 7, 2010 by Susan Cobb. Posted in Outreach News on March 22, 2010 by Susan Cobb. NSSL’s James Murnan has just finished a video on VORTEX2 as part of That Weather Show, a video/podcast series by the NOAA Weather Partners.